Mittani Hostel is located in St. Lazaro, the first and one of the oldest neighborhoods in the White City of Arequipa, where you can enjoy a beautiful panoramic view of the neighborhood and the volcanoes that are the pride of the city! 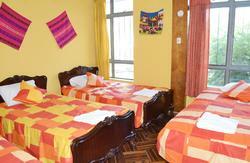 We have comfortable rooms with carpet and parquet floors, free Wi-Fi, cable TV, our rooms are en suite and shared bathrooms. Continental / American / Andean Breakfast. Bathroom with hot water 24 hours. 24 hours of Wi - Fi. Cancellation Policy : 5 days. Check-in time : 12:00 noon. Check-out time : 10:30 am..
San Francisco Square is 400 metres away, Misti Volcano is a 2-hour drive and Colca Canyon is a 3-hour drive from Mittani Hostel. 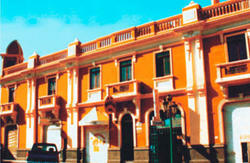 We are also 10 minutes from the Bus terminal, half block from the Calle Jerusalem Street.